Long time no blog. What can I say? Life has been busy. A whole lot of dyeing has been going on around here. Here's a sample of some yarn that husband dyed this past weekend. Isn't it pretty? 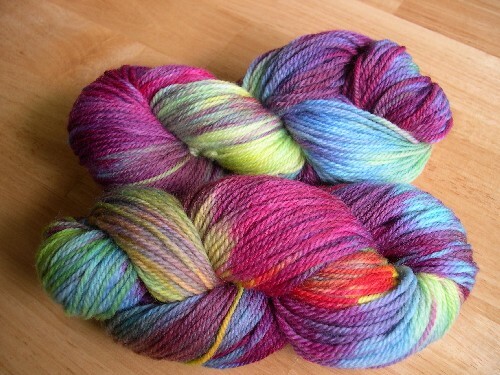 He also dyed some sample skeins of Cascade 220 to promote a dyeing class at the LYS--yes, one that he'd teach. I don't have photos, but the skein he was knitting last night was quite reminiscent of Mountain Colors. The man does have an eye for color. Here's daughter wearing her Fibertrends hat...pre-felting. This sort of reminds me of a character from Fat Albert. Remember Dumb Donald from that cartoon? One of daughter's friends spent the weekend with us and presented me with the hat Saturday morning. She wanted to know exactly how something like this was going to become a hat. She seemed to accept my explanation. Too bad we didn't have time to actually felt this thing over the weekend. I'm one of the last people in the world to knit Cozy. I'm doing it in charcoal grey Nature Spun worsted weight. The pattern is wonderful! 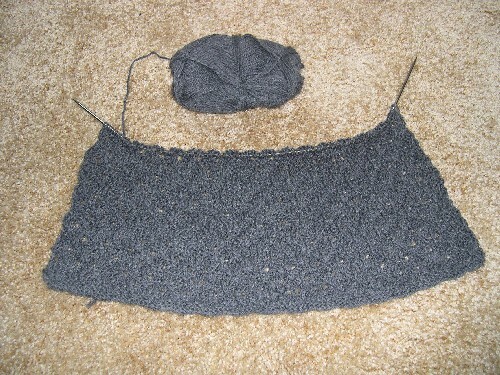 I modified it a bit by adding on an additional 18 stitches to give myself a slightly wider wrap. My goal is to finish this by SAFF. We'll see. Have you read about Stephanie's encounter with the weenie? If not, you need to. Judging by the picture, I'd guess said weenie is a frequent business traveler. The male of this species are known to be asses! Trust me on this. I traveled extensively for business for 4 years. She does look a little like Dumb Donald. I love Cozy too! 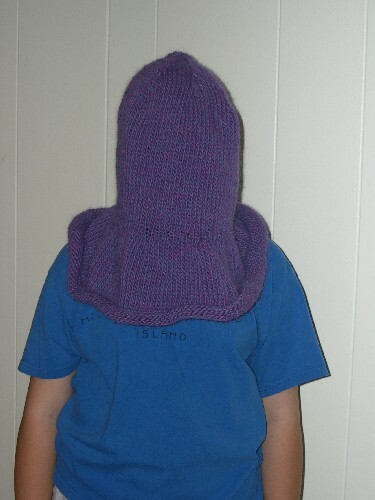 I haven't knit it yet, though it's on my list. I tried last year but I had a yarn that didn't really work. I can't wait for SAFF! You husband truly has a good eye for color. That guy on the plane was a totaly weirdo! That's OK about cozy, I've never did Clapotis! I think they take away your knitty membership for that! I love the handdyed yarn! That sock book looks great too...I seriously need to work on my fair isle gauge before I tackle them! The hand painted yarn is beautiful! Has the hat been felted yet? I'd love to see the "after" pic.